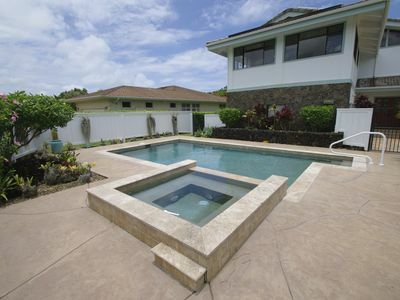 You’ve found the property of your dreams for your Hawaiian family vacation. 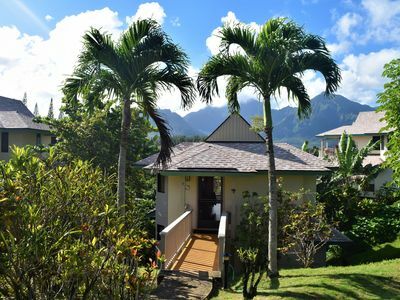 Discover Punahele, a three-bedroom home in Princeville on Kauai’s North Shore. 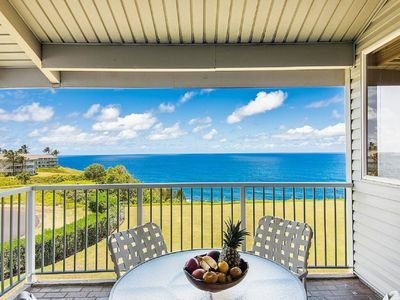 The vacation rental has breathtaking ocean views, convenient proximity to Kauai’s famed North Shore beaches, enormous lanai, upscale plantation-style architecture, and luxurious furnishings. 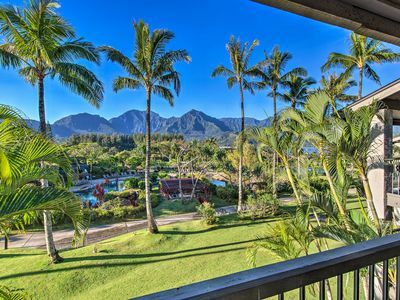 The views from your manicured lawn are of the iconic Bali Hai, the inky blue waters of Hanalei Bay and the pristine greens of Makai Golf Course. Find yourself surrounded by the beauty of the natural world everywhere you turn. 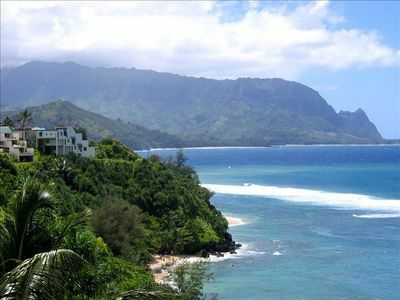 Punahele is conveniently located to Princeville with its upscale shopping and restaurants, Hanalei with its taro fields and bohemian vibe, the Kilauea Lighthouse with the charming NeNe geese, the natural wonder of the Napali Coast, and Ke’e beach. 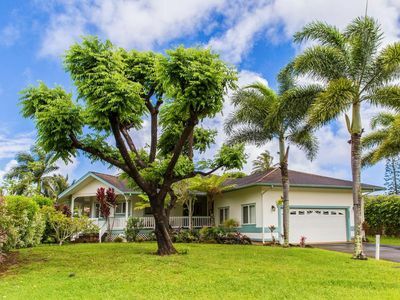 The exterior of the home is shrouded in tropical foliage, offering you wonderful privacy and a feeling of being tucked away. The exotic experience of the outdoor lava rock shower will surely become a family favorite! 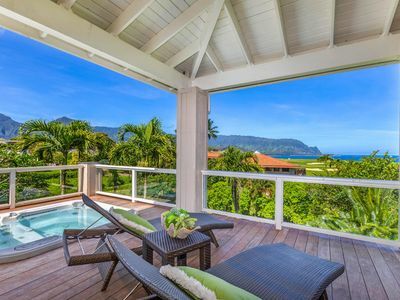 Perhaps the most striking feature of the outdoor living space is the 1200-square-foot lanai overlooking the private green space, Hanalei Bay, Bali Hai, and the verdant green mountains. 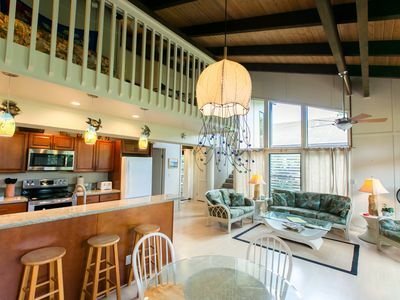 With its multiple living and dining spaces, you may find the home to be the ideal space to spend the majority of your vacation. 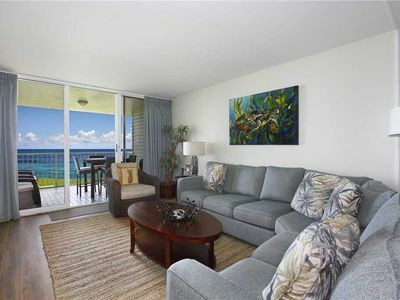 Take in the beauty surrounding you, while enjoying the gentle trade-winds and stunning sunsets. 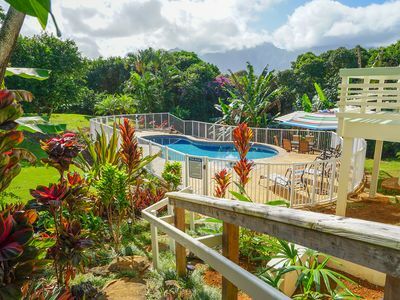 With a tiki bar, grill area, and a hot tub, there is almost no reason to leave this little slice of Hawaiian heaven right outside the sliding glass door. 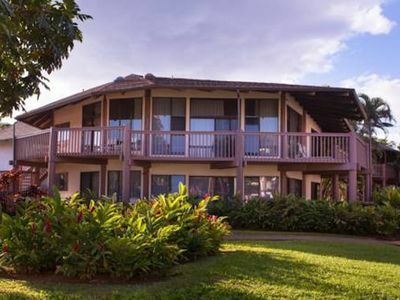 You’ll find the interior of Punahele eminently livable, with vaulted ceilings, white bead-board, and enormous windows to enjoy the abundant sunshine. The generous living room offers a large wraparound sofa, with two additional side chairs, a flat-screen TV, and an ornate fireplace. 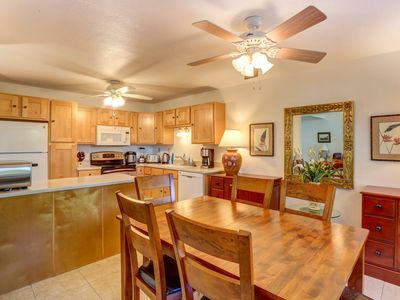 A lovely spot for conversation or evening electronic entertainment. A separate living area on the first level offers another space for a different generation to enjoy their own fun. 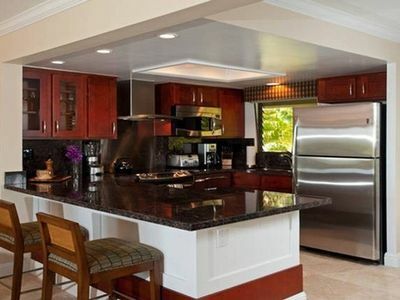 The huge gourmet kitchen offers the group chef a chance to shine. With solid surface counters, professional-style appliances and enormous workspace, gastronomic wonders are sure to emerge from this space. 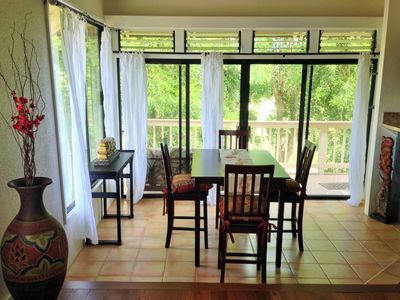 Take the time to savor them at either the adjacent formal dining space for 8 or al fresco at one of the several dining tables on the lanai. The master suite offers a king-size bed and bath with dual vanities and a rock-wall walk-in shower. Two additional bedrooms have king and queen beds, respectively, and share a full bath with a marble-tiled walk-in shower. A half bath also houses the convenient washer/dryer. 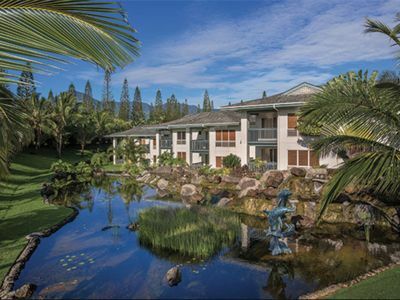 Punahele will undoubtedly become one of your most treasured family vacation memories. 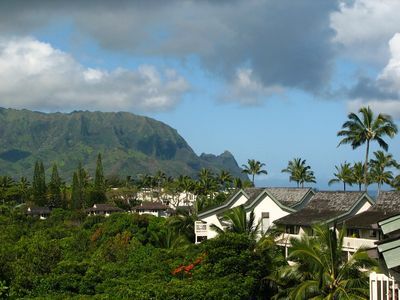 We look forward to introducing you to this tropical gem on the north shore of Kauai. 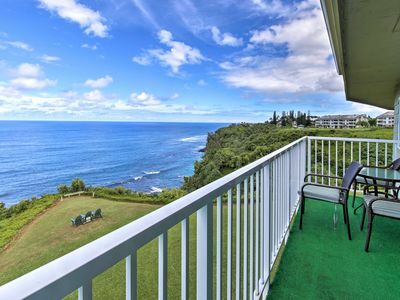 Oceanfront Kauai Resort Condo w/ Luxury Amenities! Rainbows! Waterfalls! 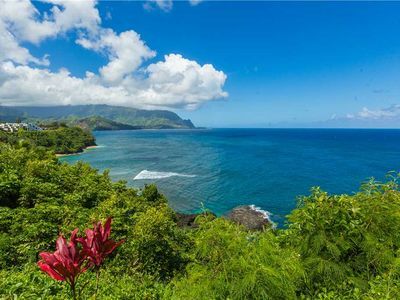 Hanalei Bay! 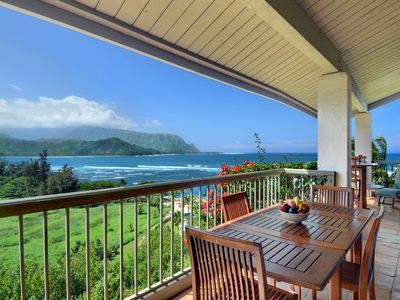 Wrap Yourself in Views! 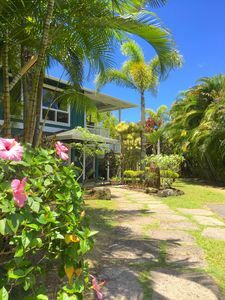 Tropical Family Villa - Walk to Pristine Anini Beach! 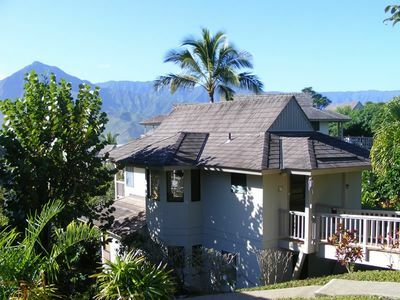 Hanalei Bay Resort #9304 & 5: Awesome Hanalei Bay Views and AC!